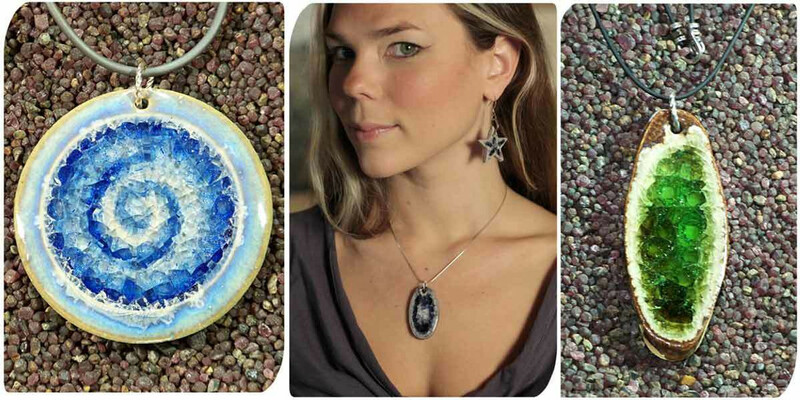 Recycled glass jewelry made from crushed beach glass & melted bottles! Unique necklace pendants in both bold and natural colors. These simple, elegant & minimal necklaces are great for both women & men. Select from our hand-thrown swirl pendant to the graceful curve in our ellipse pendant, or the whimsical, glass heart necklace - now available in red! We have lots & lots of color options. We string them on an adjustable waxed cotton cord. Or choose from one of our handmade necklaces - a simple but striking black or silver rubber cord with silver clasps. Or buy just the pendant gem & you can create your own personal look with our striking recycled glass jewelry.